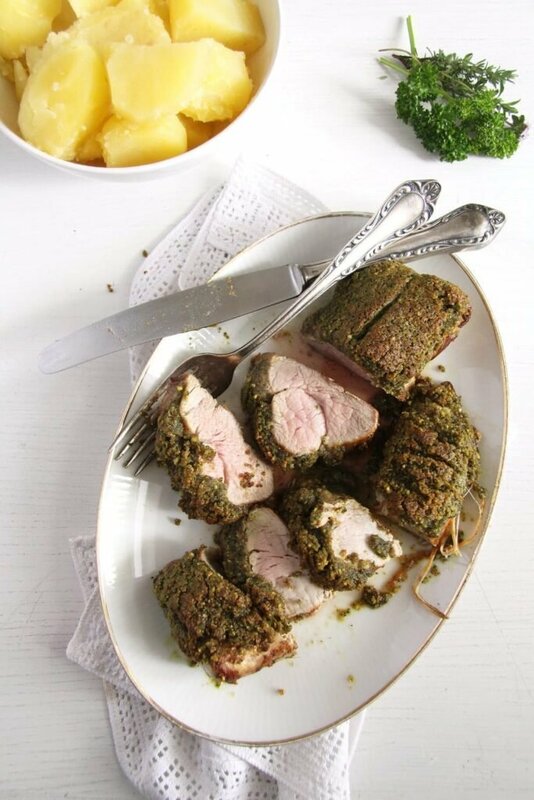 Tender pork tenderloin with an aromatic parsley-thyme crust. Another recipe using quite a lot of herbs, I have so many of them already, I seem to be throwing a bunch or two of herbs in everything I cook these days. We had some really nice sunny days followed by rain and so on and that’s really helping a lot in my garden, the herbs and the few flowers that I have are just bursting with life. I cooked this pork tenderloin only on Thursday and although I took a few pictures before we got to eat it, I didn’t really mean to post it (that’s why the pictures are not so great, I just took them out of habit, without spending too much thought on them). But then we got to eat the meat and we liked it so much, I just had to put the recipe on the blog. I think this might be the very first time I can actually say I cooked a really good pork tenderloin. Most of the times I cooked a similar recipe before, I had the problem of the meat being too dry. I always assumed that one has to cook pork until completely white, at least that’s what all the cookbooks I have always stated. 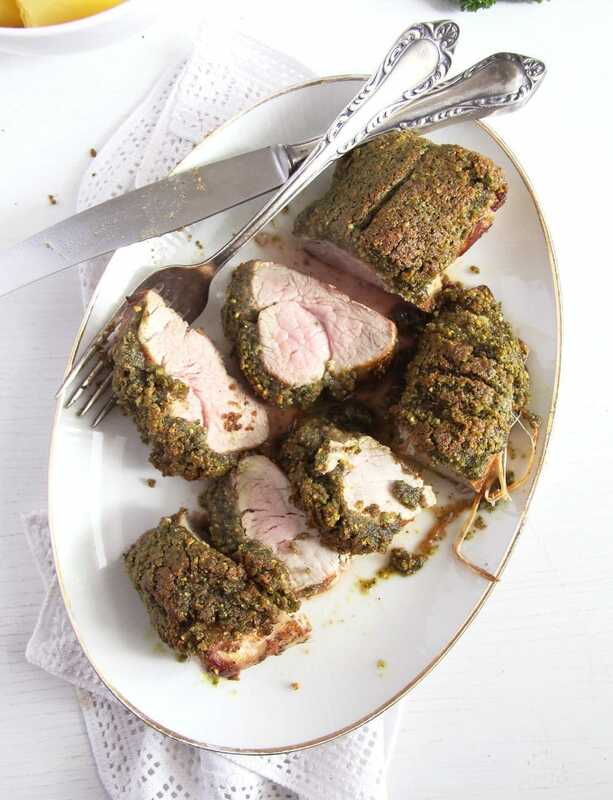 But after seeing pinkish pork tenderloin online lately, I did some research and found out that a little pink color left in the meat is not bad at all, but completely desirable, the only way to ensure that you won’t choke on your dry meat. 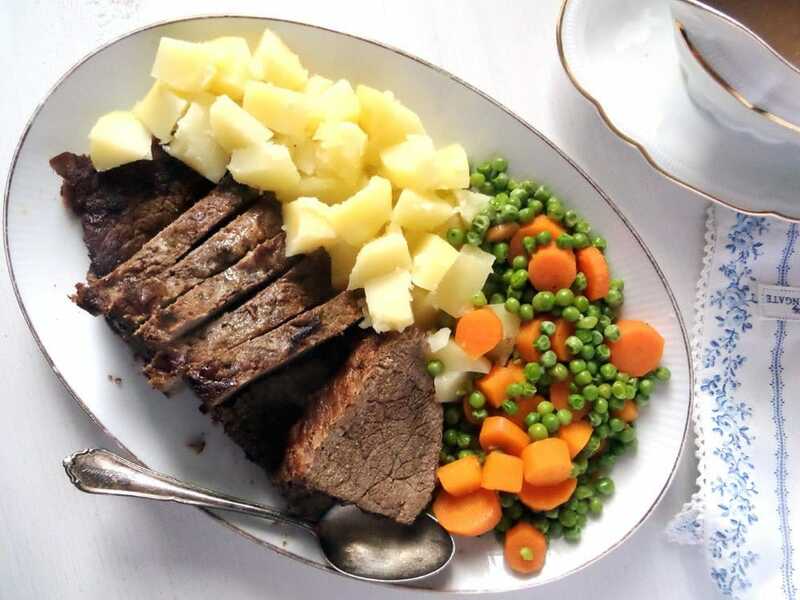 The meat would still be cooked through even in this state, but not all the juices would be sucked out of it. I tried it and it worked, this was the best pork tenderloin I have ever had, including those eaten in restaurants, who tend to have the life cooked out of them as well. After this success I am sure I won’t be so hesitant to buy pork tenderloin again, I always avoided it actually because I was never happy with it before. I used whole meal breadcrumbs for the crust, afterward I wished I would have taken the white ones, just for the color, I think the crust would have been greener that way. Regarding the taste that doesn’t make any difference. 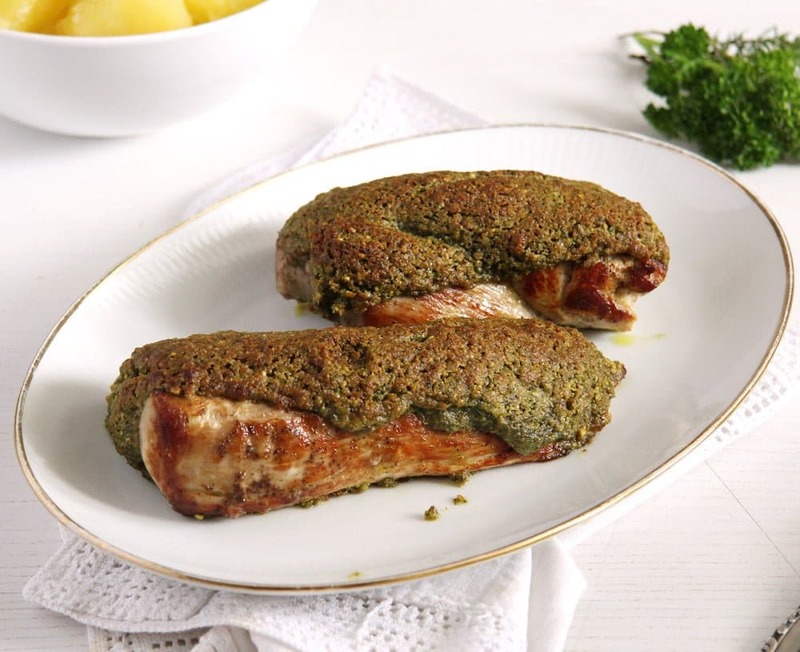 So if you are in the mood of eating a lean, tender piece of meat, aromatic and loaded with herbs, give this recipe a try, I am sure you would like it. Place the butter, herbs, shelled pistachios, breadcrumbs and lemon zest in a food processor. Mix until the ingredients are finely chopped and you have a rough paste. 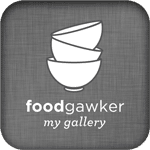 Give this mixture between two pieces of plastic foil and press to form a small and thin rectangle, about as long as your tenderloin halves and double as wide. When the butter is cold, you should be able to cut two pieces of this mixture to cover each of your tenderloin halves. So form this rectangle to have roughly the same size as your meat pieces. Wrap the butter rectangle in the foil and refrigerate for about 30 minutes. Preheat the oven to 240 degrees Celsius/ 460 degrees Fahrenheit. Wash and dry the meat. Remove the silver skin from the tenderloins. Cut the tenderloin in half. Sprinkle with salt and pepper all over. Heat the oil in a heavy skillet. Fry the meat pieces on all sides until nicely browned. Place the meat in a lightly oiled ovenproof dish or leave it in the skillet if that's ovenproof. Take the butter out of the fridge and cut the rectangle in half. Press each piece on top of one of the tenderloins. Place in the oven and bake for about 7 minutes. Take out and let rest for 5 minutes. Cut into pieces and serve. The meat should be cooked through with just a hint of pink. Wow! This looks amazing Adina! 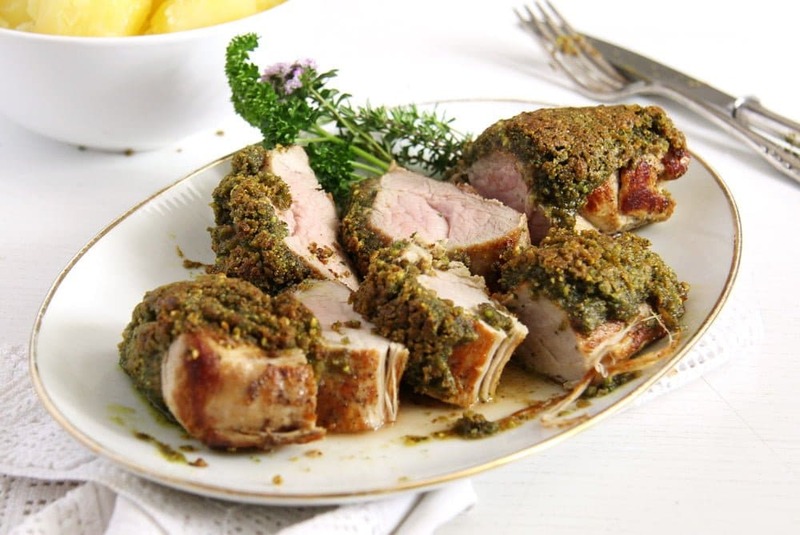 I love pork and this herby twist looks magical! I remember when I always thought pork should be “white” as well and now I do know better. 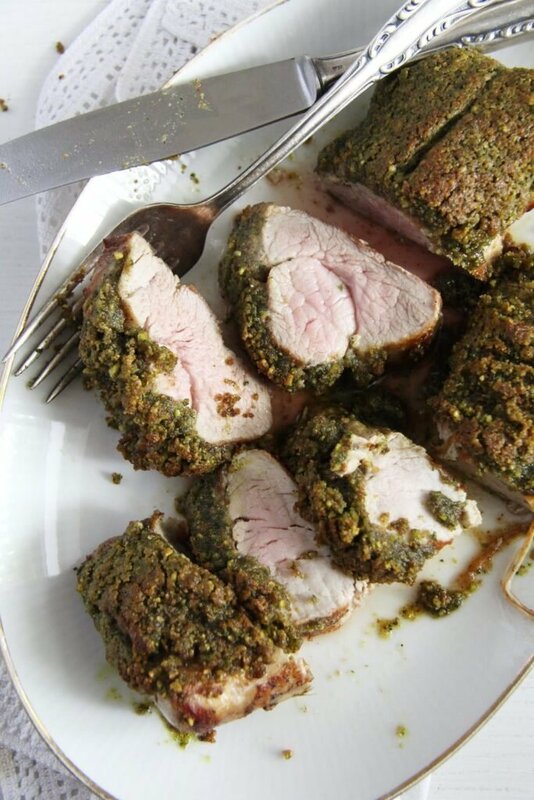 I love cooking with pork tenderloin and the herb crust looks great! I’m glad it turned out so deliciously and you posted this. 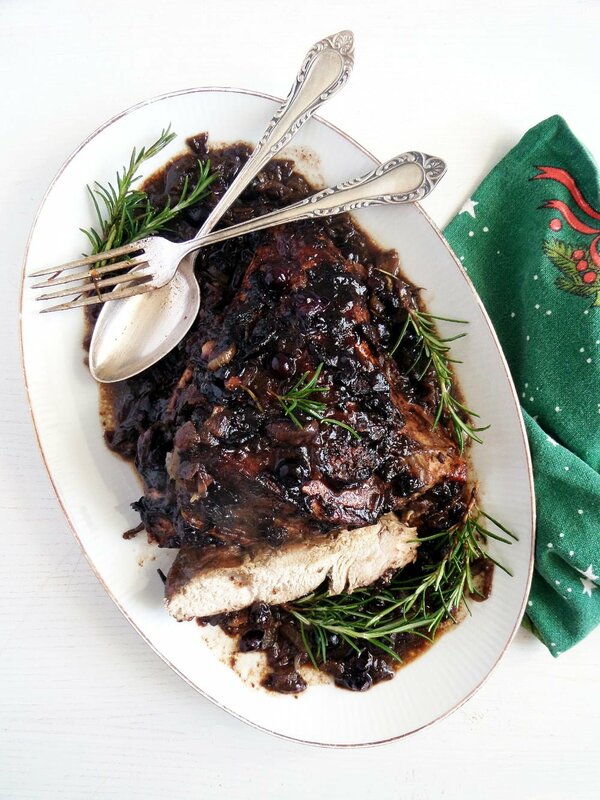 pork tenderloin is one of my favorite meats to prepare and a definite favorite to eat, so i’m always looking for twists–love the herbs here! Adina! This looks spectacular. I’m really a pork fan and usually cook it on the grill, but this looks so perfect that I’m going to give it a try. 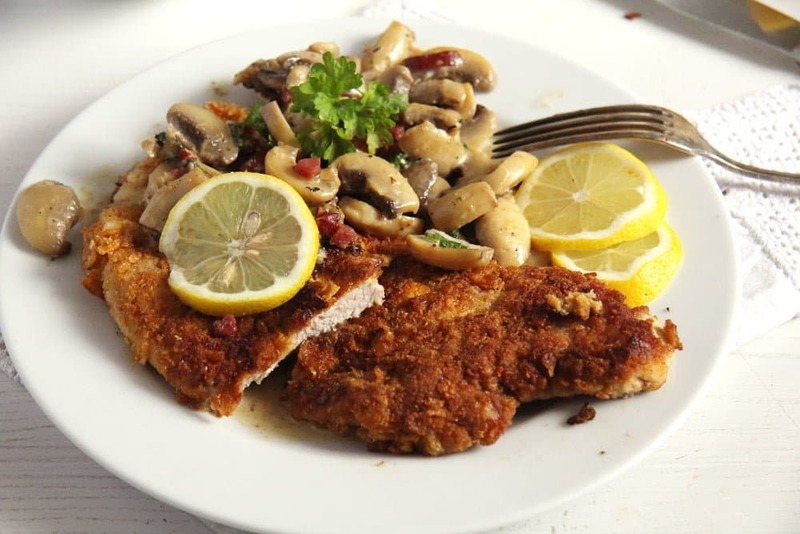 AND, I must tell you that you have some of the best looking meat/dinner recipes out there. Yummy!